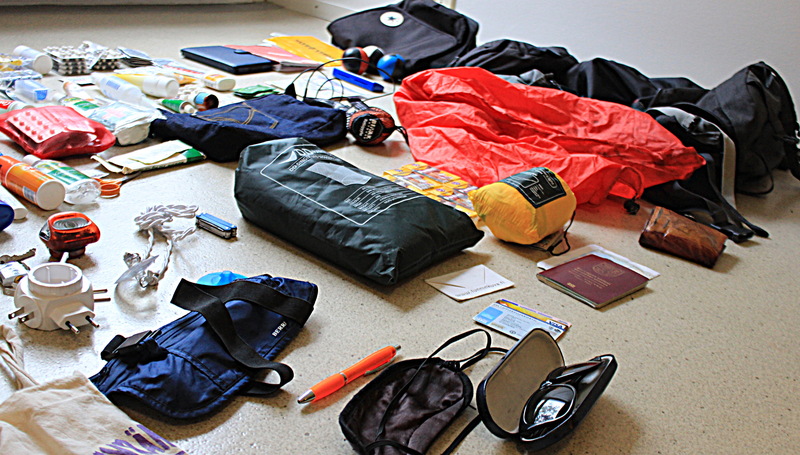 What should you pack for a round the world trip or some other long journey? I cannot give you a definite answer, but I can share my own round the world packing list with you. I have a 75 liter McKinley backpack that I bought some years ago. Backpacks are expensive, but I recommend you invest on a good one. I probably need to buy a new backpack soon, because this one is already coming apart. Besides a larger backpack, you should always have a smaller travel day bag for the times when you can leave most of your baggage in your accommodation. I prefer a shoulder bag to a backpack because I find it faster and easier to take a camera or a water bottle from a shoulder bag than a backpack. I keep all the items of my backpack inside plastic bags. It makes finding the items you need and reordering the interior of your backpack easier and faster. I use a simple color coding method for the bags: green plastic bags are for clothes, blue for other items. The laundry bag is a more durable white plastic bag. In addition, the plastic bags help keep all your belongings dry. For the same purpose as the plastic bags. I even keep some of the smaller accessories in minigrip bags inside the plastic bags. I keep my passport, credit card and some of the banknotes on a moneybelt that remains hidden around my hip. A variation of the fake wallet. While it does contain some money – just a little bit more than I think I’m going to need that day – and a few cards such as my student card, losing the wallet for muggers or pickpockets wouldn’t be the end of the world. You just need to hope they’ll be fine with just a wallet and run away without finding the moneybelt. My wallet doesn’t have a place for coins, so I also have a smaller purse that I just keep inside the wallet. A lot of backpacker travel only with 2 or 3 t-shirts, but I decided to pack some more. T-shirts are preferably be of light color so they don’t heat too much in the sun. According to some sources, darker clothes can attract more mosquiteos as well. I only had one somewhat decent white t-shirt in my wardrobe, so most of my t-shirts are a bit darker than that. Even if you don’t want to pack too many clothes, you should take more underwear than t-shirts for your comfort. The one I have is actually a thermal sports underwear, but the idea is the same. I have three pairs of short and thin socks and two warmer pairs. Or actually two and a half, because I later noticed that I have one extra sock in the bag. Well, I’m sure I’ll break or lose one of the others at some point! Makes the chilly evenings with cold floors much more comfortable. I’m also used to sleeping with these. A versatile shirt for every weather. The hood can protect from rain and cold wind. While they might be too thick for sultry weather, cargo pants are otherwise very handy. The extra pockets are useful for carrying additional items such as maps. My pants also come with sealable flaps with buttons that prevent items from slipping out of my pockets too easily. Shorts that keep your knees visible are not acceptable in all cultures. Therefore, if you’re planning to go to Middle East or similar destinations, you should definitely have some longer pants with you. Even if you don’t go there, you might want to pack light pants with you anyway, because they are comfortable and protect shins from insect bites. As with cargo pants, I prefer shorts with multiple sealable pockets. I’m only planning to go swimming quite late in the journey, so I might as well have bought these on the go. I have a very thin jacket that weights next to nothing and doesn’t take much space, but still offers some protection for cold breezes. I have a tweed flat cap that is a bit too warm for tropical destinations and a knit cap. I was planning to find a light cap and/or a bandana for the trip, but I couldn’t find ones that I liked in my hometown. I’ll probably buy something for the swelter further up the road. Light leather shoes that are fit for walking in varying conditions. I should have also taken some shoe polish with me, because my old shoes are not in the best possible condition anymore and demand occasional maintenance. Choose a model that’s good for miles of walking and try them out before you leave. I prefer seamlessly adjustable cloth belts to leather belts, but that’s just my personal taste. An extremely light sleeping bag that weights about 50 grams. It doesn’t offer much warmth, but is useful in accommodations where bedsheets aren’t available. A trek towel that takes only a fraction of the space of a regular towel but dries just as well. No, I didn’t steal this! I’m quite sure they just let us keep the blankets once! I’ll probably buy a sarong in India to replace this, as it’s way too small for a person as tall as me to work as a blanket. I often fill it with clothes and use it as a pillowcase. This could also be used as a pillowcase. I could use it to avoid wasting too many plastic bags while shopping if I’d just remember to take it with me once. One tiny microfiber cloth for cleaning camera lenses as well as laptop and smartphone screens. 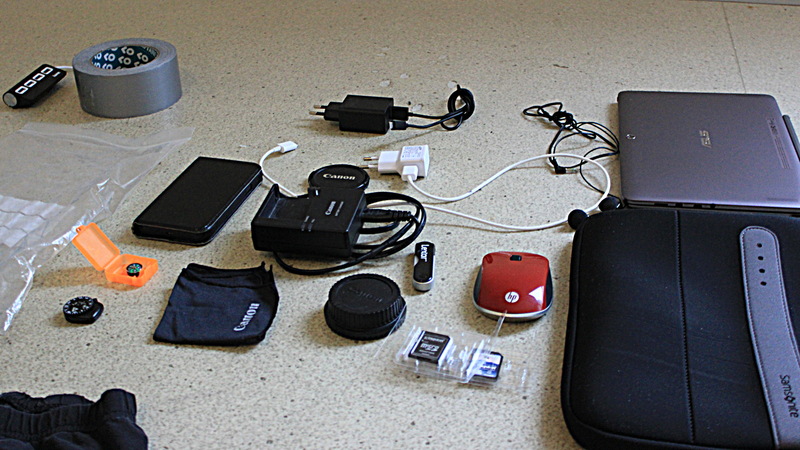 Technical equipment such as laptop and computer accessories on a laminate floor. An ultraportable laptop/tablet hybrid with 10,1″ screen. Some travelers only use a tablet, but I write so much that I need a good keyboard. A laptop cover pouch where I also keep most of my other computer accesories. Not necessary for everyone, but I find it very useful for photo editing and other work. I had not owned a smartphone before, but I finally decided to buy one for the trip. Xcover3 is water and shock resistant, which makes it very useful traveling. Moreover, it includes a battery saving mode that can make the battery last for over two days. My favorite thing on this RTW packing list! Or on any list, ever. If you take an e-reader with you, I recommend that you don’t only download the heavy and intellectual classics – sometimes you’ll want to read some light and entertaining storiest that will make the long waits go faster. If I’d buy a camera now, I’d definitely pick a more compact model. 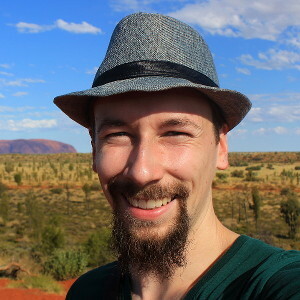 I’ve once traveler with a compact water resistant camera and I know that many people do just fine with just a smart phone, but now I need better quality for my blog and other publications. Wait a second, why is a wool sock listed in the category of technology and accessories?! Well, it’s just an old habit of mine. I never pack a large camera bag with me – instead, I keep the camera inside a wool sock that offers some protection from minor damage. Just in case I’ll lose one. One 16 Gt MicroSD card for my smartphone, another 32 Gt MicroSD card with SD Adapter for my SLR camera and an extra 32 Gt memory card that I just decided to take along for good measure. A gift I got at my farewell party. Newest laptops tend to have only a few regular USB ports. Mine only has one that’s already reserved for my mouse, so I bought a hub for the times when I need to hook my phone or Kindle to the computer. Not completely necessary to buy in advance. Many hotels and hostels in Asia have adapters and it’s sometimes cheaper to buy the adapter from an airport. 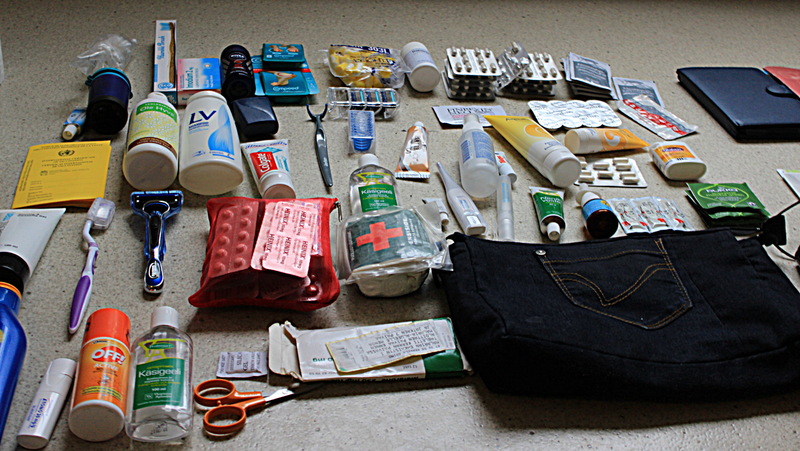 Medicine, hygiene items and other health related stuff to be packed for a long journey. The second toothbrush was a gift I got at my farewell party. If necessary, shampoo can also work as a laundry detergent if you wash your clothes in a sink. I did, however, take real washing powder with me as well! I filled a small shampoo bottle with some powder so it doesn’t take too much space. If you don’t pack earplugs, you’re gonna have a bad time! The last time I checked, I may have packed almost 20 pairs of disposable earplugs. Yes, I know absolutely overdid this, but they weight next to nothing and now I don’t need to buy any more earplugs this year! And I wasn’t sure if I’d find my favorite earplug model overseas! I usually sleep with the same pair for a few weeks and wipe the earwax off from the earplugs in the morning to make them last longer. I keep my hair short, but I sometimes use a comb to help with beard trimming. Toilet paper is often missing in many toilets, both in the Western world and other cultures. In many Asian cultures, toilet paper is not even commonly used as locals prefer washing with water. These countries usually have toilet paper in tourist destinations, but once you get off the beaten path, you might want to take a roll with you. Strong sun lotion with both UVA and UVB protection. Not completely necessary to buy in advance as these can also be found from destinations. A lot of people just use cortisone lotions. Sometimes I’ve used my shaving gel that includes aloe vera, because it also calms irritating skin. Keep this in your day bag and use it frequently before eating. Soap and water sanitize better, but they are not always available. One small tube that is not too big for hand luggage in airplanes and a larger tube. I have atopic skin that dries easily, so use this quite often. I also believe that these are more useful for chapped lips than lip balm. For all the more serious skin conditions. For abscessed scars and scratches. Anti-fungal treatment for ringworm and smaller fungal infections. I don’t know why I bought the powder when the lotion is easier to use. Fungal infections can be quite common while traveling – I very often get some little infection in my palms – and the medicine can be hard to find in foreign pharmacies, so I strongly recommend you buy one of these. If you don’t have one and you start so see small light papules growing inside your skin, just apply cortisone on your skin and hope for the best. For fever, headache and other pain-related conditions. For diarrhea. A lot of doctors recommend that you just get over the diarrhea by resting for a few days and taking care of your nutrition, but if you have a long bus ride coming, that’s probably not an option. To help with the pain of a sore throat. Strepsils is a global brand that can be found almost anywhere, so you don’t necessarily need to buy these in advance. For flu and allergic reactions. Getting antimalarial medicine makes you face an interesting dilemma: how much are you ready to pay for lesser side effects? The price quickly multiplies if you decide to take the most expensive option like I did. It’s also difficult to estimate how many pills do you need. I have antimalarial tablets for a total stay of about 5 weeks in malaria zones. Some of the tablets were leftovers from my previous trip where I didn’t end up needing them. Not necessary for everyone. The mucous membranes of my nose are always in a miserable condition because of some undetermined allergic flu, so I use these to help prevent nosebleeds. Additionally, I have some different nose spray left from a previous medical recipe that can help open up a stuffy nose. These may help digestion and prevent diarrhea. I also plan to use lactic acid bacteria tablets as my “placebo pills” that I’ll take for any slight health problems, because placebo actually works even when you know it’s placebo. Rehydration powder helps you get back the sugar and salts that you’ll lose during diarrhea. You might also need the components when you sweat excessively in heat. Many travelers don’t take a thermometer with them. After all, if you do have a fever, you’ll most likely feel it. They don’t weight much, so take plenty. You might be surprised by how often you get small scratches. Hopefully your shoes are a perfect fit and you’ll never need these. Just something I’ve had in my drawer since my military service that I decided to grab along. Shades with UV protection and a case that can take a few hits. A small headlamp recommended in the equipment list of the best backpacker guide book ever written, Madventures – Kansainvälisen seikkailijan opas (”International adventurer’s guide”, in Finnish only, sorry!) that also lists many other items found on this post. Compasses are very useful in navigation both in cities and the nature and I try to always keep one with me. I got an extra compass (that was much better than my original compass) as a farewell gift, but I sadly lost it on the first week of my trip. Sorry! A tiny version of the Leatherman multitool. Many travelers always pack a hammock with them. I have never had one before, but thought I’d get buy one now. Later I’ll see if I have any use for it. Mosquito nets are are widely available in places with mosquitoes, so packing this before departure is not necessary. Light nets treated with permethrin might be harder to find on the go. In case I decide to was my laundry in a sink at some point. For the same reason as the previous item on this round the wold packing list. At some point, you’ll lose or break at least one ballpoint pen. It took me less than a week of traveling when one of my ballpoint pens just stopped functioning. Of course, they are very easy to find just about everywhere, so you don’t need to hoard countless of pens in your backpack. A whole roll weights a lot and is not completely necessary, so I pulled out and threw away several meters of the tape before I left. Name tags with my name, phone number, e-mail and nationality. Two in the backpack, one in the shoulder bag. I also have my name and my e-mail in the lock screen of my smart phone. Some travelers just use large garbage bags to cover their backpack at rain, but my backpack already included a raincover when I bought it, so I decided to stick to that one. A small, lightweight umbrella. Easy to find anywhere. In some places like Beijing, you’ll find plenty of people selling umbrellas in the streets and tunnels once it starts to pour. For sleeping in brighter environments. These are often given for free in airplanes. A portable urinal is probably completely unnecessary, but I still bought one when it was recommended somewhere. A small padlock with 3 keys for hostel lockers. In some cases, it can also be used to close your backpack. My backpack has one zipper on the bottom part that can be locked with a padlock, but the lock would only slow down thieves, because the insides of the backpack can also be reached from the other end. Make sure that the expire date is still far away and you have enought empty pages for the visas and stamps. I have a Visa Electron that I mostly use at ATM’s and an emergency Visa that is connected to my father’s account, not mine. I have about 300 US dollars and 100 euros hidden in my backpack. I tried to tape one stash on the inside of my backpack but the tape started to detach very quicky. The other stash is hidden inside the pouch of my mosquito net. For some reason, my insurance company sent me two cards instead of one. I keep one in my wallet and the other one in a difference place. This not-very-well-known card entitles EU citizens to get public medical services for the same price as the locals anywhere in the EU. The European driving license allows you to drive in many countries outside the EU. For some countries and conditions, however, an International Driving Permit (IDP) is also required. My Finnish student card (that expires at the end of September) also works as a International Student Identity Card (ISIC). The look of a foreign card tends to confuse locals, but you should still get the student discount. Just print plenty of these and put them to different places. Also keep the scanned copies in your e-mail so you’ll always have access to them. The certificate is required for some countries to show you’ve been vaccinated for yellow fever. My favorite item in this RTW packing list might be the Amazon Kindle, but snack bars come as a close second! There are plenty of moments where your comfort depends on your blood sugar levels. When the train is late or all the shops are closed by the time you find your accommodation, you’ll be glad you’ve garnered something to eat anywhere, anytime. A part of a “survival set” I got as a gift. No, I don’t plan to eat these by myself when I feel homesick. Instead, the snacks of your homeland serve as a great gift and icebreaker for hosts and other people you meet en route. I got this as a gift from my friend. Many of my friends in Finland compare me to Snufkin, the harmonica playing vagabond from the Finnish Moomin books, so the friend thought I’d need one too. The harmonica is a rather cheap model, so if I seriously start to practice harmonica during my journey, I’ll probably buy a more expensive instrument to replace it. 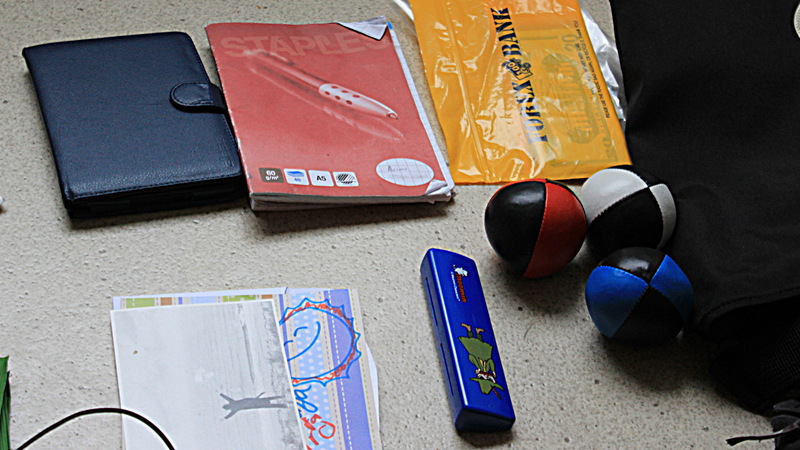 I have previously traveled with a diabolo, but it requires more room for practicing. Juggling balls demand less space and can also be used indoors. If I really wanted to keep my backpack light, I’d just roll some socks and juggle with them. I got all of these at my farewell party. Some – but not all – of the letters were deliberately given for me to take with me on the road. I didn’t have a change to store any more items after my farewell, so I just decided to take these along. Silica gel is the stuff you find inside new shoes that’s supposed to collect humidity. I don’t think that just one silica gel bag can do much, but I happened to have one in my home, so I took it for the trip. It’s currently in the plastic bag where I keep my clean boxers, t-shirts and socks. I’m not sure why I packed this, but it weights next to nothing so it doesn’t really matter.. I’ve used some of the string to decorate my backpack. First, there are objects that are completely missing from my supplies that might be useful for some conditions. I haven’t packed any winter clothes with me because they demand so much space. Instead, I plan to buy or rent these when I need them. Some travelers also want to have more formal or stylish clothes for job interviews, nightclubs or something else, but I did’t take any with me. I also didn’t pack any utensils for cooking this time – if you’re planning to take the Trans-Siberian Railway or just hope to save money by cooking your own food, an aluminium pot, a plastic plate and a spoon will take you far. In addition, I am a young man without any serious medical conditions. If you have more serious ailments, you should investigate how these may impact your journey. The cheaper antimalarial tablets, for example, are not recommended for people who take antidepressants. 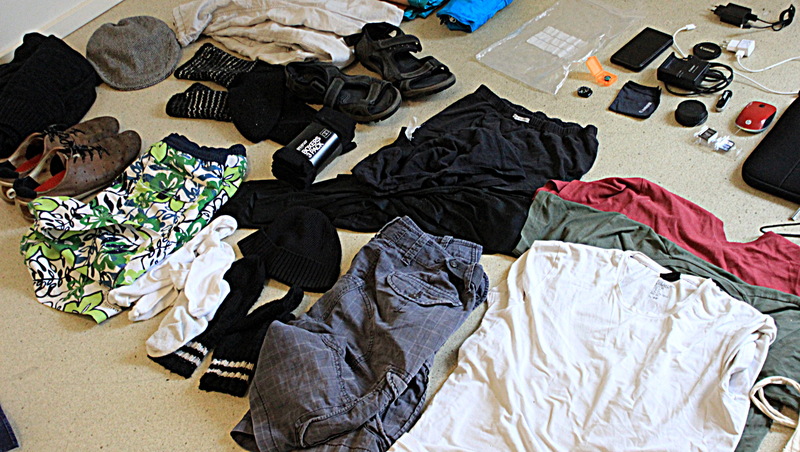 There are some differences in packing for a round the world trip between men and women. Women’s underwear weight less and are usually smaller than men’s boxers, but if you decide to take makeup and other beauty products, they’ll require extra space. Some items of women’s intimate hygiene such as tampons might be harder to find in some countries, so take that into account. Furthermore, rules for dressing tend to be much more strict for women than men in many conservatice cultures. I haven’t had a chance to weigh my backpack, but if I had to guess, I’d say it weights about 15 kilograms (33 lbs). (UPDATE 28/6/2016: I recently got a chance to weigh it, and my estimation was correct! The backpack weights just about 15 kilograms.) I know I could make the backpack a lot lighter if I wanted, but I chose to buy most of my supplies before leaving. If you want to travel light and save money, you can choose another tactic and only buy new things as you start to need them. It’s especially easy to save money on meds by getting them later, as they tend to be much cheaper in developing countries. Do you have any thoughts or questions about my RTW packing list list? Please share them in the comments!